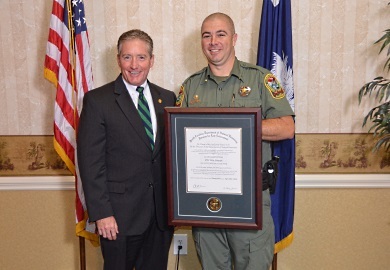 For the second year in a row, Private First Class Wes Stewart of Lancaster has been recognized as the statewide S.C. Department of Natural Resources Law Enforcement Officer of the Year. 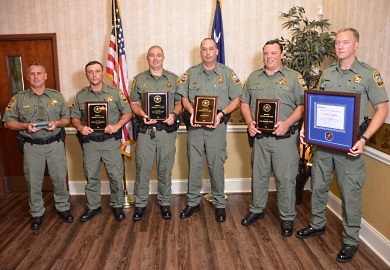 Stewart and six other SCDNR officers from around the state were honored for their dedication and diligence in protecting the state's natural resources through enforcement, education, special investigations, intelligence and records and staff operations at a ceremony held Sept 23 in Columbia. The annual awards and banquet are dedicated to the late R.M. "Bobby" Gifford, a highly regarded law enforcement officer who served as chief of the S.C. Department of Natural Resources (SCDNR) Law Enforcement Division for many years. The S.C. Wildlife Officers’ Association, the Harry Hampton Wildlife Fund, the family of Chief Gifford and the SCDNR come together annually to honor the state's top officers. Stewart joined SCDNR in 2005 as a fisheries technician and began working for the agency’s Law Enforcement Division in 2013. He is by any estimation an exemplary officer, according to Col. Chisolm Frampton, SCDNR law enforcement director. According to reviews prepared by his supervisors, "Stewart has an excellent working relationship with his fellow officers, [other] local law enforcement agencies, and magistrates. He is a true team player." Stewart is also involved in public outreach activities and does not miss an opportunity to "meet with church groups, kids at school, hunting clubs, and local law enforcement agencies to educate the public on hunting, fishing, environmental and boating laws." This past year alone, Stewart conducted 22 public presentations impacting more than 2,000 people. On the law enforcement side of the ledger, Stewart wrote 239 warnings and brought 196 cases this year, including a unique case that involved protecting two endangered plant species on Forty Acre Rock Heritage Preserve in Lancaster County. Stewart set up cameras at the site and coordinated countless hours of surveillance of the area which resulted in 27 cases for destruction of the rock outcrops where several species of rare and endangered plant species thrive. Other SCDNR officers were recognized from all of the state’s Natural Resources Enforcement Regions; Marine Law Enforcement Investigations, Education and Staff Operations; and as the National Association of State Boating Law Administrators (NASBLA) officer of the year. The SCDNR Officer of the Year is chosen from those candidates. Region 1 (Anderson, Abbeville, McCormick, Edgefield, Greenwood, Laurens, Union, Cherokee, Greenville, Oconee, Pickens and Spartanburg counties): Private First Class Ryan Abernathy of Ware Shoals. Region 2 (York, Chester, Fairfield, Lancaster, Kershaw, Chesterfield, Lee, Darlington, Marlboro, Dillon, Florence, Marion and Williamsburg counties): Private First Class Wes Stewart of Lancaster. Region 3 (Newberry, Saluda, Aiken, Allendale, Bamberg, Barnwell, Lexington, Richland, Sumter, Calhoun, Orangeburg and Clarendon counties): Private First Class Ed Laney of Dalzell. Region 4 (Horry, Georgetown, Berkeley, Hampton, Charleston, Beaufort, Colleton, Dorchester and Jasper counties): Lance Corporal Michael Brock of Bluffton. Law Enforcement Investigations & Education: Staff Sgt. J.B. Kinsey of St. George. NASBLA Boating Officer of the Year: Private First Class Jordan Douglas of Summerton. In addition to these six officers, Sgt. Jim Shelton of Charleston was recognized for his selection earlier in the year as the NASBLA Southern Region Boating Educator of the Year at that group’s annual conference. Shelton is assigned to the Law Enforcement Education Section in Region 4 as an Education Coordinator. Regional and statewide officers of the year are selected by a committee of key SCDNR law enforcement personnel and captains and rated in six categories: employment history; enforcement activities and specialties; awards, achievements and accomplishments; leadership, teamwork and attitude; family and community involvement; and outstanding cases. South Carolina's Natural Resources Law Enforcement officers serve and protect the state's natural resources by patrolling more than 31,000 square miles of the state's lands and inland waters. Officers also patrol 750 miles of tidal shoreline and marine waters, to the state's territorial boundary three miles offshore and beyond on special federal assignments. Throughout the state's 46 counties, DNR officers enforce laws and regulations pertaining to more than 450,000 registered boats, and a half-million licensed hunters, anglers, and the multi-million dollar coastal fishing industry. Officers enforce Wildlife Management Area regulations and statewide litter laws, instruct hunter and boating education, conduct statewide search and rescue operations and perform community service.